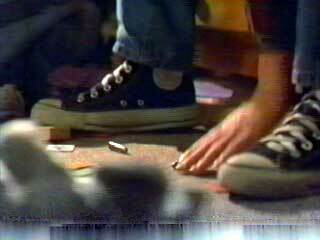 Cody Morgan wears black Converse “Chuck Taylor” All Stars in the film. 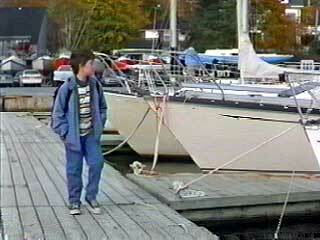 James searches the docks for a companion. The Magic of Marciano is about ten-year-old James Stanton (Cody Morgan) who lives with his single mom Katie (Nastassja Kinski) in a small coastal town. Much of James’ life revolves around his attempts to deal with Katie’s mood swings that range from loving mom to man-hunting party girl to hysterical anger due to an ongoing mental illness that Katie is supposed to be treating with prescription drugs. Complicating the picture is Katie’s live-in boy friend Curt (Jason Cairns), who does not like James and often treats both Katie and James in an abusive manner. 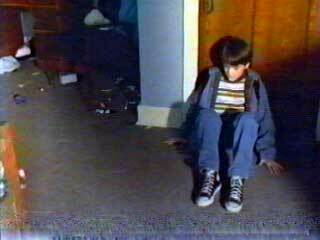 When Katie isn’t around, Curt tries to torment James or make sure he stays in his place, often causing James to flee to his room and barricade the door. As the result of his home life, James does not have any close friends at school. A poignant moment in the film occurs when Katie gives James a birthday party and the only guests are her coworkers from the coffee shop where she works. Likewise there are no close relatives. Katie’s parents are deceased and later in the film it is revealed that James was born after Katie was raped so that is why he has no father. James often escapes from this troubled existence by daydreaming about imaginery worlds where he is an Olympic swimmer or the great grandson of the king of Italy (Marciano Bendetta), or is able to take revenge on Curt. At school he is easily distracted from classwork, spending much of his time drawing pictures or reflecting on disturbing developments at home. Somehow, among all of these unfortunate events, James manages to keep an optimistic outlook on life, and continually goes down to the local marina to look at the boats. One day while he is there he see an older man Henry (Robert Forster), working on a sailboat, and strikes up an acquaintance. Although Henry is reserved at first, James persists in developing the friendship, and he is soon helping Henry sand the boat. James resents the way that Peter treats Katie. As Henry gets to know James, it is revealed that he is a retired psychaitrist, loves boats, and plans to sail around the world. While it is James’ fantasy that Katie and Henry become interested in each other, that is not meant to be although Henry uses an invitation to dinner to learn more about their family background and when James tells him of Curt’s abuse, he attempts to be of some help. Unfortunately Katie’s mental condition continues to deteriorate. Sometimes Katie acts as the responsible and caring mom for James; other times she reacts irrationally to events leading to violent episodes of anger with James, Curt, James’ school teacher, and other people in their lives. When Katie catches Curt cheating on her, she snaps completely, ends up being arrested and eventually confined to a mental hospital. With his life now completely disrupted, James must deal with the loss of his mother and learn to exist in the foster care system. The rest of the film is about how this transformation takes place, and how James seeks out Henry’s assistance and advise to make it through. James thinks about what Henry has told to him to do. The Magic of Marciano is the second film written and directed by Tony Barbieri. Although the film was completed in 2000, it had only limited distribution in foreign markets and on US cable television. Luckily the film is finally being distributed on DVD, scheduled for release August 30, 2004. Barbieri takes his small palette of dysfunctional characters and presents a story of quiet despair in the setting of a small coastal town. While the story line isn’t particularly satisfying, the strength of this film lies in the outstanding performances by its principal actors. Nastassja Kinski gives an especially effective and believable performance as the mentally ill mom, gradually spiraling into uncurable violence. One minute she is the loving mom with a great relationship with James, the next she is ignoring him to go after the lowlife boy friends that are the bane of their existence, and her mercurial ability to shift from a normal bearing to violent and unreasonable rage makes you realize how difficult life must be for young James. Cody Morgan is a real find; his premiere performance has a strong impact just like the first films of Brad Renfro (The Client) and Trevor Morgan (A Rumor of Angels). Morgan is quite good in his ability to act beyond his age, a trait you often see in kids who live with parents incapable of functioning normally. The thing that grabs you most about his performance is the outer calm and even optimism that he continually projects with virtually no support from any friends or family as the stability in his life gradually disintegrates. At the same time, he is able to maintain a very kid-like demeanor in the way he portrays his fantasy world life of escapism from the realities of school and his home life. Robert Forster in his role as James’ only friend on the outside is played in a very matter of fact way. Forster seems almost detached and distant as the retired psychiatrist from the midwest who is literally brought into James’ family life through the will of James. His role seems to be too convenient to the story line, providing James with both counseling and the one stable element in his life when Katie’s illness gets out of control. More could have been made of this relationship, but while James really wants a father, Henry is more like an uncle or grandfather, much older with a deceased wife and grown kids of his own. As the film progesses, we see gradually Henry become the one person that James can rely on to get through the traumatic loss of his mother to mental illness. James and his mom are best friends when she is lucid. James barricades the door to his room to escape the abusive Peter. 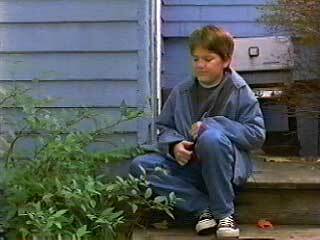 Cody Morgan, in his role as James, wears black high top chucks throughout the film. Chucks are a good fit for the independent loner James, who seems to be nine or ten but has a much higher soul age as he takes the blows that life is dealing him. Although the cinemaphotography isn’t particularly chucks-friendly, there are a few good shots during the film. 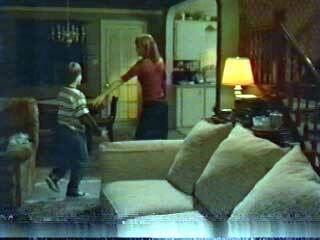 The best sequences are when James is in his room, escaping the abusive behavior of his mom’s on and off-again boy friend Curt, or plotting his revenge. After finding Katie’s gun, James fantasizes about shooting Peter. The Magic of Marciano. (2000) Cody Morgan, Natassja Kinski, Robert Forster, Jason Cairns, Will Cochran, Eugene Clark. Written and directed by Tony Barbieri. Category: Drama.